How in the world it took me this long to finally try out the Meatball Shop I have no idea. Now that I have, I’m obsessed. The Meatball Shop is a cozy little restaurant down in the LES that specializes in one thing and one thing only- meatballs. Meatballs are something I never really think of that much. 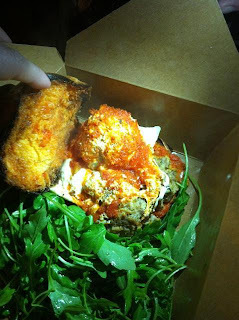 However I realized something Saturday night- I love meatballs! Mr. T and I arrived at the Meatball Shop around 6:30. The place was already packed and the wait for a table was an hour and a half. 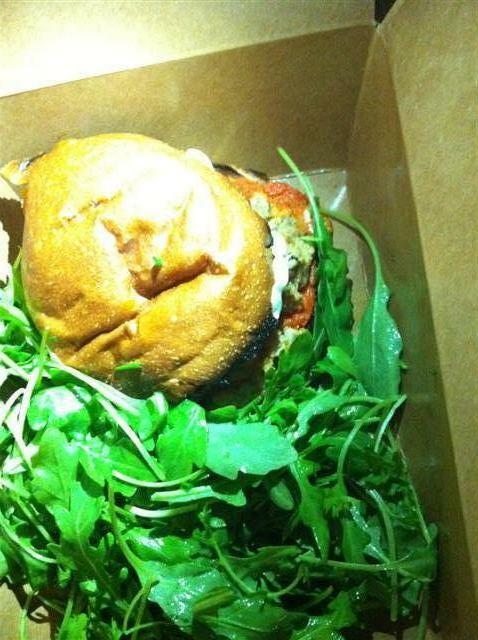 Luckily for us they just opened up a take out window so we ordered up our food and headed over to Local 138 to indulge. I ordered the Meatball Smash which is your choice of any two meatballs on a brioche bun served with any sauce or cheese you would like and a side salad. That’s a pretty great deal for $8. I went for the Beef Meatballs with tomato sauce and mozzarella cheese. As soon as I opened up my box the meatballs literally poured out with steam. I tried to pick my sandwich up but the brioche bun had become quite soggy from the tomato sauce so I just used a fork. I dove right in and I have to say my first bite of meatball was almost intoxicating. I was so in love with everything having to do with this sandwich I literally felt drunk from happiness. The beef wasn’t spicy but full of flavor and incredibly tender. The mozzarella had melted and oozed cheesy goodness all over the balls and sauce. I don’t know what they put in these sandwiches but it may be illegal. These meatballs were so incredibly delicious! I didn’t want to stop eating! I have woken up every day since thinking about going back to get them again! I’ve turned into some sort of meatball junkie, just bidding my time till the next fix. Oh Meatball Shop you absolutely rock. This is one of the best cheap eats joints to come to NYC in a long time.